Well, I wanted a more sharpened gritty look. I don't know, I love Icemember's, but I love BIG Cookie's as well. Perhaps if I could find a happy medium somewhere? I don't know, but what I do know is that I need to munge and test the replacement of the main weapon I made a few weeks ago. Any news on this my friend ? Not yet my friend. But I was gonna get back to it soon. I still have the stuff to work on it, so no worries. If you would like new, high resolution ground textures like the couple I provided Ice with, please drop me a PM with the link to the textures you use. I will then find new, high quality textures, based off of the ones you're using now. That would be quite lovely! I will be sure to let you know when I need some, friend. UPDATE - 2.24.12: Howdy folks! Nah, this map is not dead, don't worry! Sorry about the bump as this is a small update, but it does have pictures! Model of the pirate was switched along with the model of the main weapon. Also the blaster effect was changed according to how I'd imagine the weapon firing. 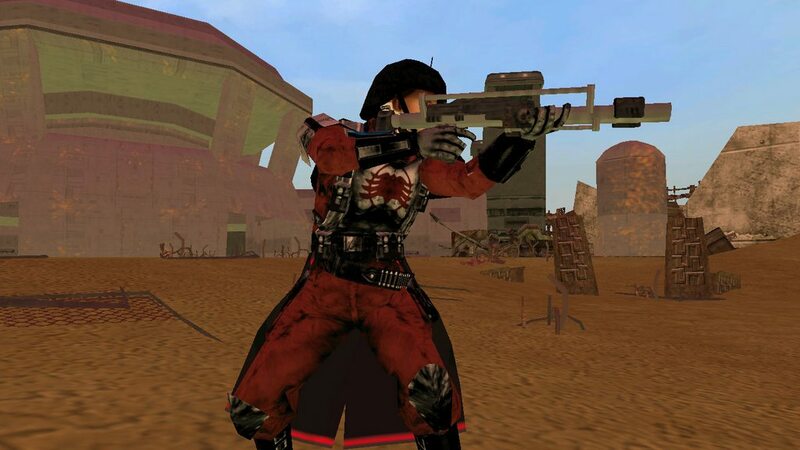 The rifle is a Coynite Disruptor Rifle, model courtesy of Acryptozoo. I didn't get pictures of his Vexa Flechette pistol yet, though, but no worries, that will come soon. I am aware of the following problems: The textures on the model are too sharpened. This was how the original textures looked and this skin is not much more than a slight recolor and retexture. Not my best skin, but I'm satisfied with it. Probably should have made the helmet less dark, though. Oh well, might go in and redo that later. As for the effect/muzzle flash, I wanted it to be somewhat of a green-yellow color. I might edit the actual texture to be more.... 'disruptor'ish, but for now this bolt will have to do. Right now it is a semi-auto weapon, but I might make it fully automatic if I get enough recommendations to do so. Also I tried to get the best angle I could on the effect. I might need to town down the velocity. The map as it stands is still the same in the main part, but I will be adding more cover to it soon and will be modifying the AI pathing some more later and possibly adding some new places and refining others. For the most part, this is what it will remain to look like until I can get someone to model me the proper facility model as seen in Star Wars Galaxies or something similar. Note: Lighting settings are back to low. Lag central on this computer with it on high/medium. I'm hoping that this map will be worth it in the end. I don't know when the next beta will come out, since I am working on this rather slowly. I am not giving up, I've just been taking breaks and evaluating what exactly I want to see in a map and what others might think would be pretty cool in a map. Yes, still working on this thing. Okay, anyone want to help me plan the side-layout? I'll actually DO the side myself (though I would like help with blaster FX. I can handle sounds and such, though. Also I need someone to model some blasters for me too. Thanks). Since I plan on having the first few versions infantry-only, perhaps with maybe a few 'turrets', I'm probably gonna remove the AT class as a whole and just replace it with a heavy class. 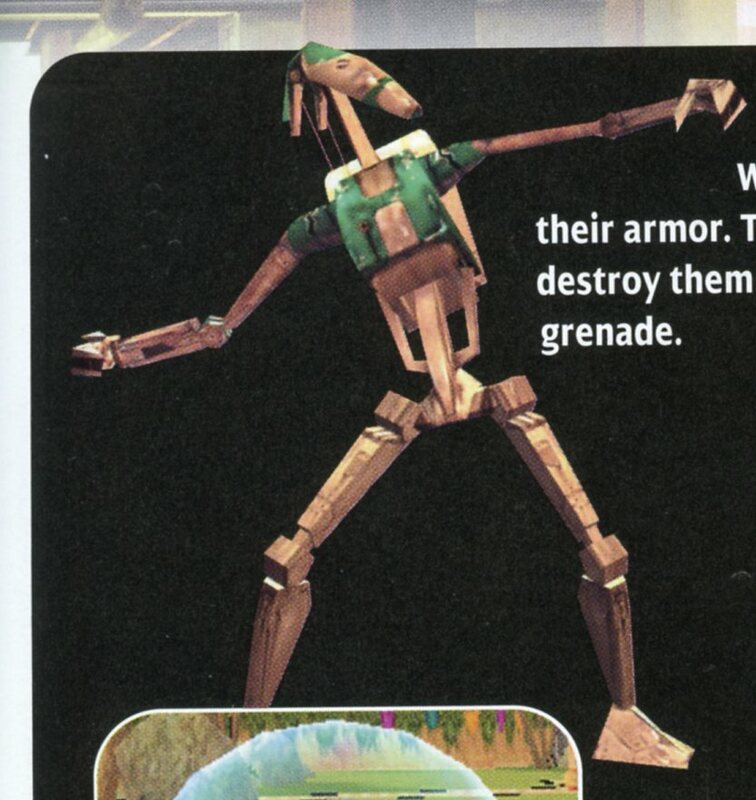 Perhaps some kind of heavy repeater (have no idea what I want for the Trade Federation regarding this) or a plasma flamethrower (SWG, which happens to be the same looking model as the one from The Clone Wars). I want to get the Lok Revenants and Trade Federation out of the way. TF = essentially CIS without B2's, but I want to make them unique, but also authentic. Lok Revenant Pirates = Mix of models. Aliens and humans alike. Non-standard issue weaponry. Acquired from Black Market. I will let everyone know when I'm working on the Empire and IG-88's Army. got any ref what your wanting for CIS besides B2s? Perhaps B1's with some gear? I don't know if B1's even had gear besides their rifles and whatever equipment they needed for their jobs, such as engineers, etc. As for the Droideka, I'm going to wait to see if Glitch can get the side-by-side blasters working correctly. I can do the skins, I just need some ideas for the units to make them fresh. I might have to reskin the default game mortar launcher. Also no Magnaguard either, because this is TPM era. So no B2's or Magnaguard. Pure pre-CW Trade Federation. I will actually also need help with actual map props (modeled or otherwise), if you'll be so kind as to help. Oh also I'll need someone to model a few things I requested in the "What Weapons Would You Like To See?" thread. If you need help with the sides. He can give out def buffs and fight with a pistol of some sort. He can give out healty and use a bow caster. lol....umm....maybe next time. But seriously though, I'll give model refs to you if you'd like. Post your pics here. Ill mosy-on-by and see whats interesting. Not that I will do them. But that doesnt me I wont do them to. Basically, as you can see, it's just a big 'arena'/'main area. 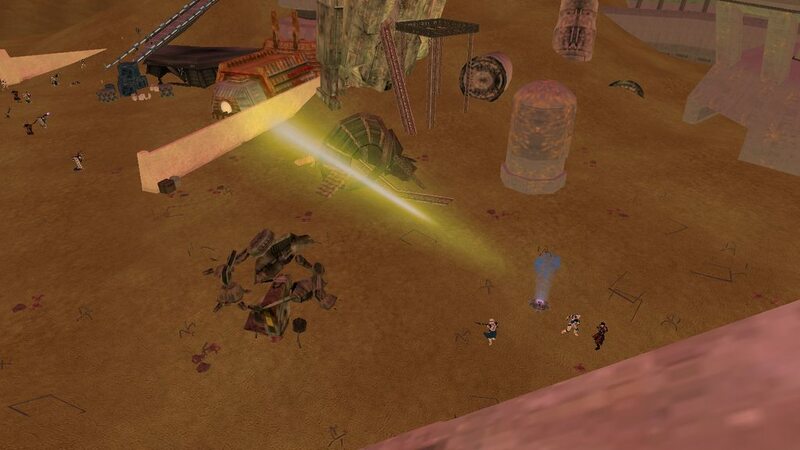 This is why I confused it as a junkyard at first, because of all the random crap everywhere. Understandable, right? However, it's just a worn down factory where Nym and his....followers stash their treasures. During the Clone Wars, I imagine that the Trade Federation would have found it and used it as a base of operations, or they found it and saw it as one of the Lok Revenant pirate strongholds (other than the main one), and attacked. IG-88, during the GCW obviously, decided he'd 'move in' and start making a droid army. Nym didn't like that, obviously, so he hired random people, regardless of factions, to take him down and take his factory back. That's how the official story went if I remember correctly, but you know. I'll also get weapon references for you, if you want me to. I just need to complete the sides. I'll get the exterior shot again. 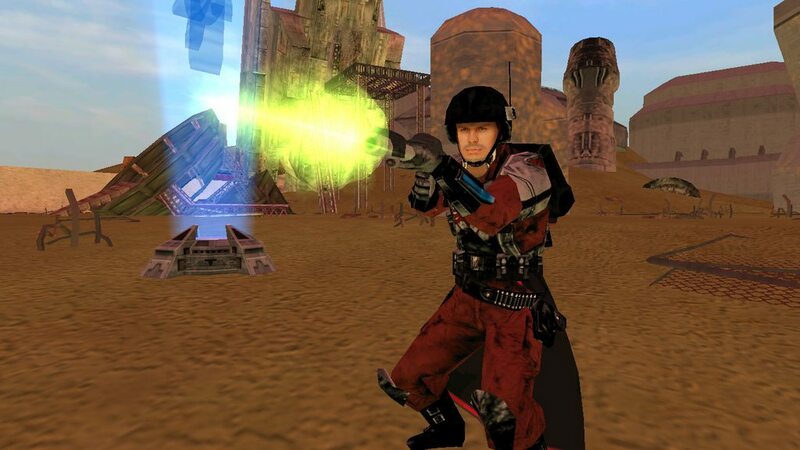 My alternate character in SWG Pre-CU used one of these for quite sometime as he was leveling up on the Officer Class. Went well with his red composite armor set. 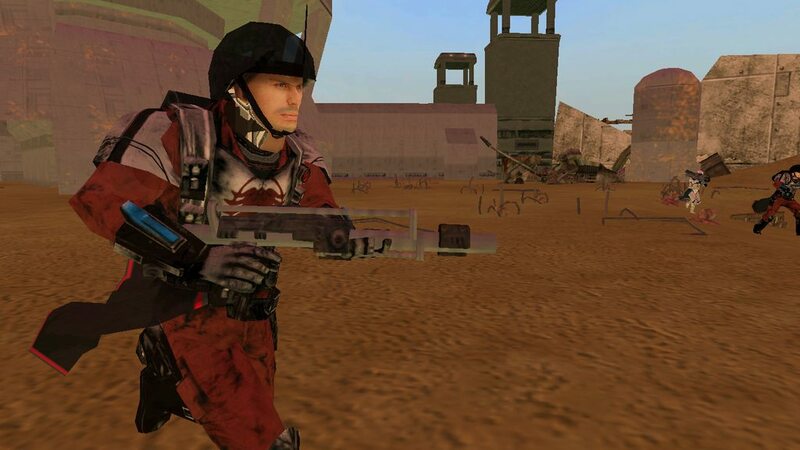 Despite it being derived from the German H&K G36, I always liked the look of it in SWG. It also fired a really nice projectile and caused massive damage, however I forgot what the projectile was. I think it was a bluish projectile. Come on, our Bothan friends in SWBF2 need their own weapons after all! Besides, it looks awesome and is based off the M1 Carbine, I believe. Looks like a variant of E-5 carbine, however I believe it looks different enough and cool enough to be its own weapon. Any self respecting slaver will find this as an effective weapon. 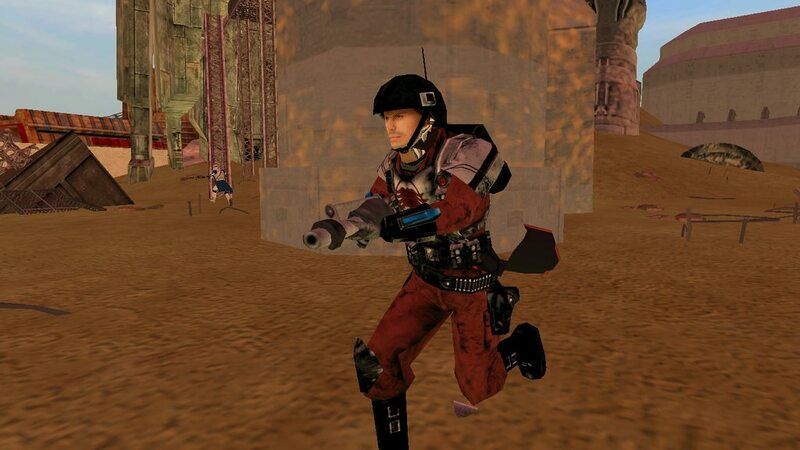 Though in SWG, it confused me on whether this was projectile or energy based, because of the effect it made, however...nice looking BH/Slaver weapon indeed. The models for both the carbine and rifle are the same, but I always preferred this model of DXR-6 over Jedi Academy/Outcast's DXR6. I specifically need this one for Nym on my map eventually. Will post rifles, pistols, and heavy weapons tomorrow. Maybe even melee weapons. Lemme know what you can and can't get done. Mainly the weapons used by Nym (his slugthrower carbine, the J-1 Rifle, and the pistol) and the buildings are the primary concern. Also need a severed AT-AT body for the main entrance. I have a bit of a weapon request, again...sorry to be so annoying. The video is a little blurry, but it's the best I have been able to find quality wise. Also, when in the Outtakes here, when Nym turns around, you can see the weapons by the other Revenant commandos. Also, this pistol that Nym is holding in this screenshot would be nice. It will be a little hard to work off of with videos especially, but those are the ONLY references I can find and are the closest thing to a proper Lok Revenant pirate loadout. I have no idea what the other blasters are, but I just want to at least reach visual authenticity. Oh and I would also like a proper Factory compound please or at least the thing in the back there where IG-88 is suppose to come out. As you can see, the ground...as I'd like to call the 'landing area' or the 'staging area'. 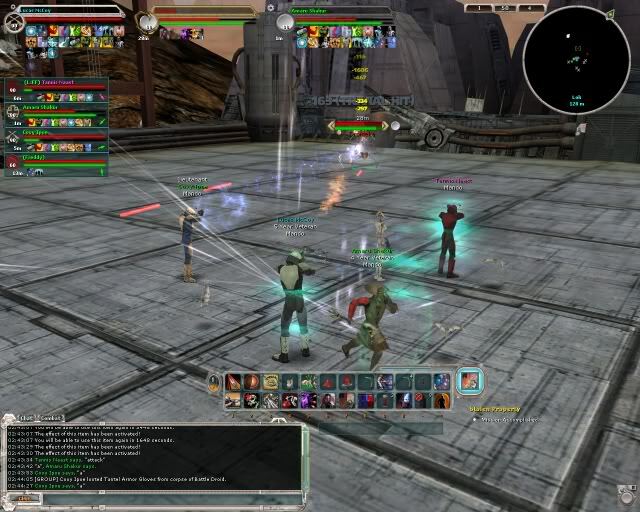 The building in the background is where IG88 comes out in the heroic instance. Thanks a bunch for whoever does this for me.